It's easy to make your apartment bathroom shine with a few inexpensive tricks. Check out these design ideas to spruce up your apartment bathroom. This simple and inexpensive change can alter the entire look and feel of your bathroom. Opt for a brightly coloured, patterned shower curtain if you're looking for a new centrepiece to the room, as it will distract from the more mundane elements. Or, to create an elegant look throughout the room, choose something similar to your wall colour. 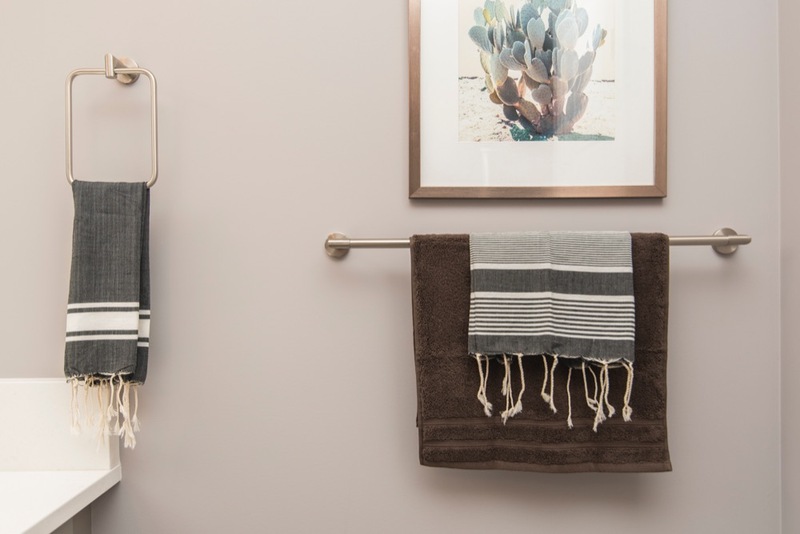 Pair your new curtain with matching towels to bring the room together. Apartment faucets are usually quite bland, but there are some fancy ones on the market. Choose one that suits your tastes to give your bathroom a unique, personal touch. Grab a new faucet at your local Home Depot for a quick, simple change that makes a big difference. A few hanging plants can really brighten up a dull apartment bathroom. Just keep in mind the lighting and room temperature requirements to optimize growth for the plants you select. Use this list to help you choose plants that will prosper in your bathroom. A fresh work of art can make any room feel brand new. Hanging art on the walls can help warm up your bathroom and give it a style that suits yours. For a more unique display, get a book of postcards by your favourite artist, frame them, and hang them on the walls. Be sure to enclose artwork in a glassed frame to protect it from the moisture. Instead of spending time and money painting your bathroom, why not use decorative stickers? These are extremely easy to not only put up, but also take down when you leave. They're a great alternative to paint, especially if your landlord doesn't allow new paint jobs. Decorative wall stickers come in a wide range of designs, from geometric shapes to flowers, and can be purchased from IKEA or Lowe's.